Discussion in 'General Knife Discussion' started by stabman, Jun 18, 2018. My brother found me the ultimate gas station knife while filling up in Detroit. 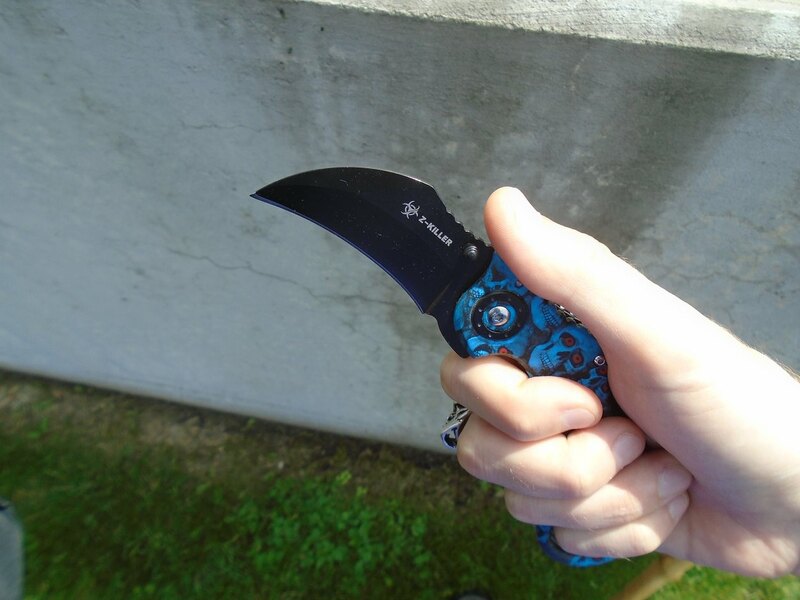 -It has a biohazard symbol on the blade and...it is labelled as being intended for killing zombies!!! It is truly a sublime thing of cheesy beauty. C.S. Graves, flatblackcapo, Wharn and 22 others like this. Ahh.. But you're missing one of the most important elements of the truest of all gas station knives! The zombie blood splatter, of course! Bonus points if it's in green instead of red, haha. BK14, JupiterPaladin and stabman like this. It certainly has the right markings for a gas station knife, but the true test to qualify, is price (14.99 or lower) and how long before it falls apart or is dangerous to use. You left out the sweet sweet backspacer. It may not fall apart all that quickly though...it is built better than some. But it does have a soft stop pin that began denting immediately, so that is good. It is pretty sweet, eh? evilgreg, OddBlade, Ajack60 and 1 other person like this. 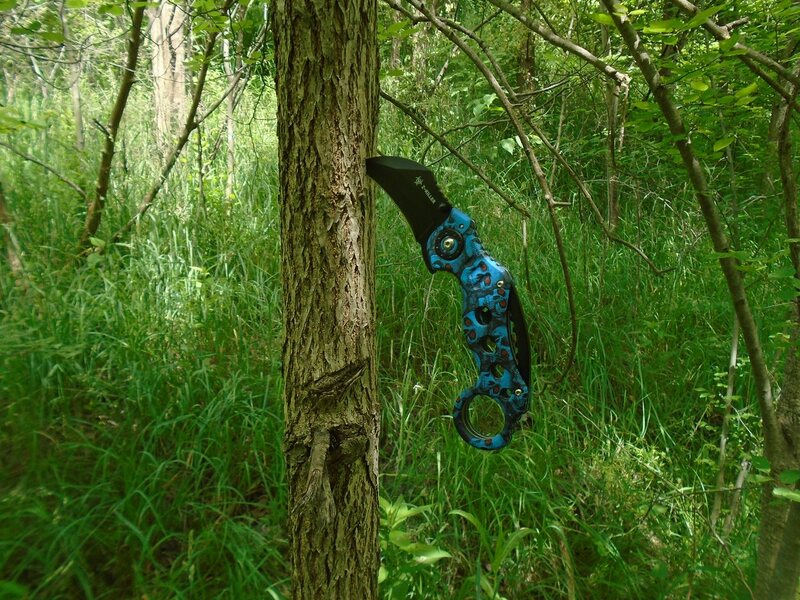 Ahhh the zombie karambit. Perfect for trapping and getting up close and personal -you know, the proper way to fight zombies! LG&M and stabman like this. Sweet!!! I really hope he didn't bring that into Canada! Yes, this evil device is indeed inside Canada, endangering our entire way of life. evilgreg, jbmonkey, LG&M and 1 other person like this. This was the most exciting thread title I've seen in some time. Thankfully, the content did not disappoint either. With any luck I shall find other gas station knives that are as perfect an example of the genre, but it will take some searching. The skull camo really adds to the overall effect. You should get one too...they likely made more than one of them. evilgreg, autogateman and austonh like this. Brothers with a sense of humor, gotta love them for that . He does have a keen eye for authentic gas stations knives, and all this time, you didn't think he was paying attention. I had mentioned wanting to go on a gas station knife shopping trip, and he remembered. When he brought it over, I was super happy. I was more pleased actually than when I received my last high quality knife. Watch out. If you ever drop it in a pile of blue skulls with red eyes, you'll never find it. autogateman, Planterz, ChazzyP and 2 others like this. Hopefully I don't drop it when raiding the shores of blue skull beach. I threw up when I found this at my little brother’s house. @McFeeli beat that. 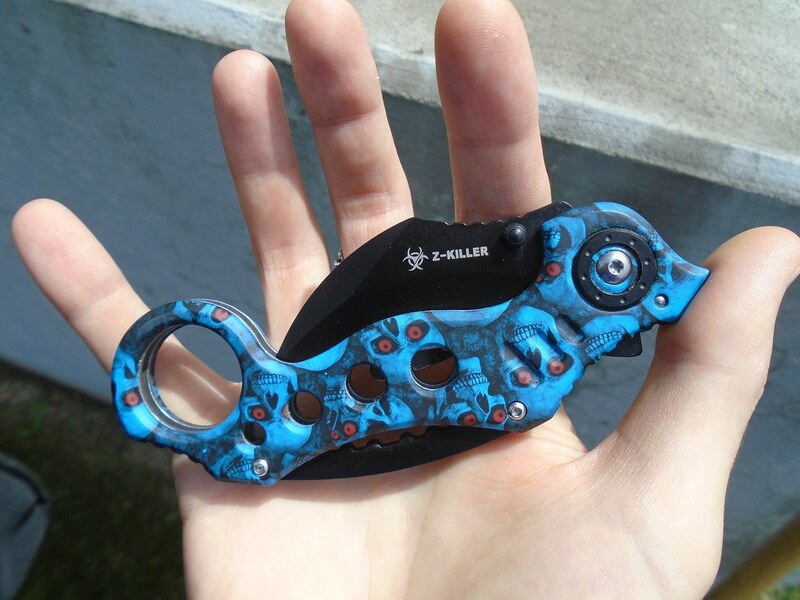 And its half serrated. C.S. Graves, evilgreg, Mecha and 4 others like this. That's pretty great...but it would be better with skull camo. McFeeli, FortyTwoBlades and Lapedog like this.